In his oft-forgotten 1883 travelogue The Silverado Squatters, Robert Louis Stevenson of Treasure Island and Dr. Jekyll & Mr. Hyde lore writes of a “sylvan solitude,” where “the silence was unbroken but by the great, vague voice of the wind.” Far from his native Scotland, the adventure-hungry wordsmith is here describing the quiet, pine-studded mountains north of the picturesque town of Calistoga, at the head of California’s Napa Valley. Long before the region became world-renowned for wine-making, Stevenson and his new bride Fanny spent their extended honeymoon in 1880 on the slopes of Mount St. Helena, by far the tallest peak in the area. 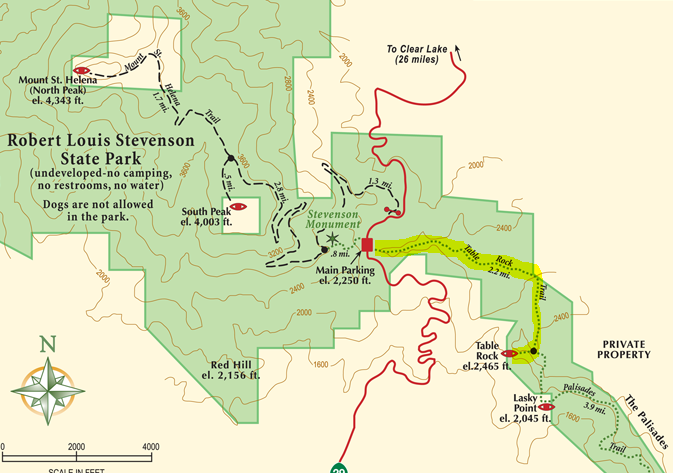 The lofty mountaintop—as well as ragged band of igneous rock called “The Palisades”—are now encompassed in a park bearing Stevenson’s name. Despite its proximity to popular wine country, Robert Louis Stevenson State Park feels rugged and far-flung. 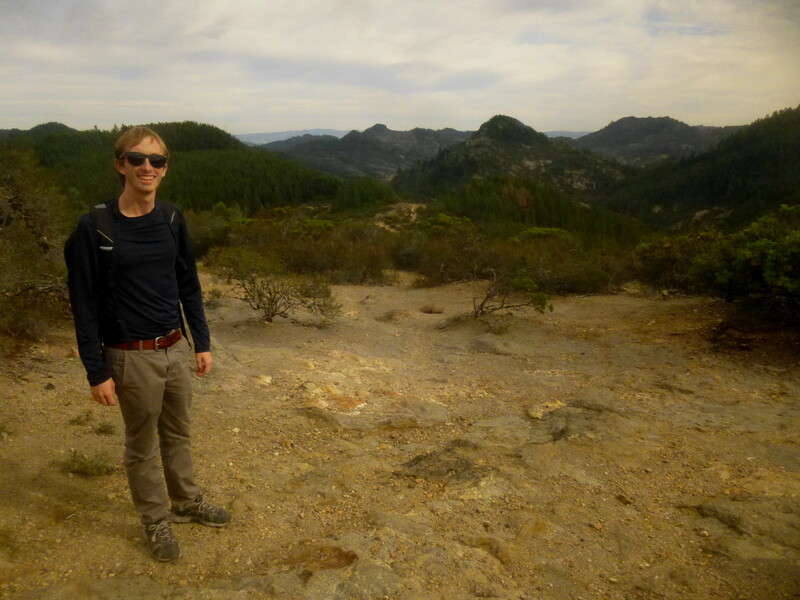 A half-day’s hike out to Table Rock and back gives visitors a taste of such remoteness—and encounters a number of peculiar surprises along the way. Though just eight miles from Calistoga, Robert Louis Stevenson State Park feels immensely different from the quaint but touristy town of wineries, hot springs, and bed-and-breakfasts down below. The steep and windy drive to the park quickly ascends above the Napa Valley vineyards into an unblemished thicket of towering pines. The park has no visitor center or entrance station—only a pair of parking lots astride a mountain pass nearly 2,000 feet above the valley floor. Approaching from Calistoga, the hike to Table Rock takes off from the shady parking area on the right (hikers climbing Mount St. Helena will want to park off to the left). The hike begins just to the right of a large brown sign giving distances to Table Rock and the Palisades Trail. Immediately the trail climbs a pair of switchbacks before spitting out onto a wide path obviously once used (or is still used) for vehicles. Take a left onto the wide dirt path and follow it uphill for about 2/10 mile to the route’s first open viewpoint. Walk 100 yards out to the tip of the grassy knoll for sweeping views to the north and east. 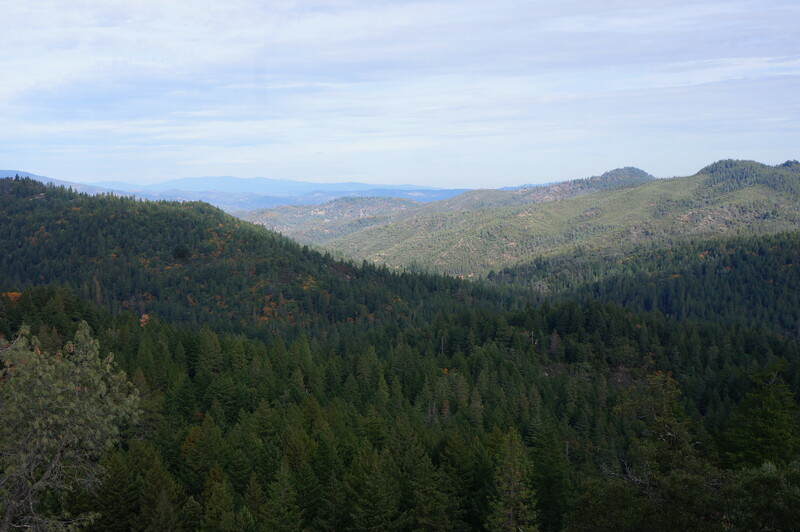 The steep hillsides of the Mayacamas Mountains give way to lush green valleys. Lofty Snow Mountain (7,043’) is visible off in the distance; on a clear day, vistas stretch as far as California’s Central Valley and the Sierra Nevada. 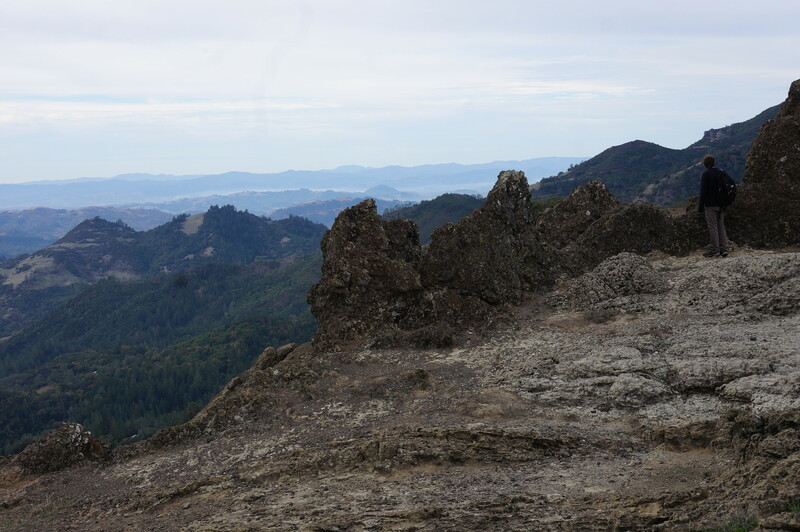 Of course, Mount Saint Helena (4,343’) dominates the scene to the northwest. 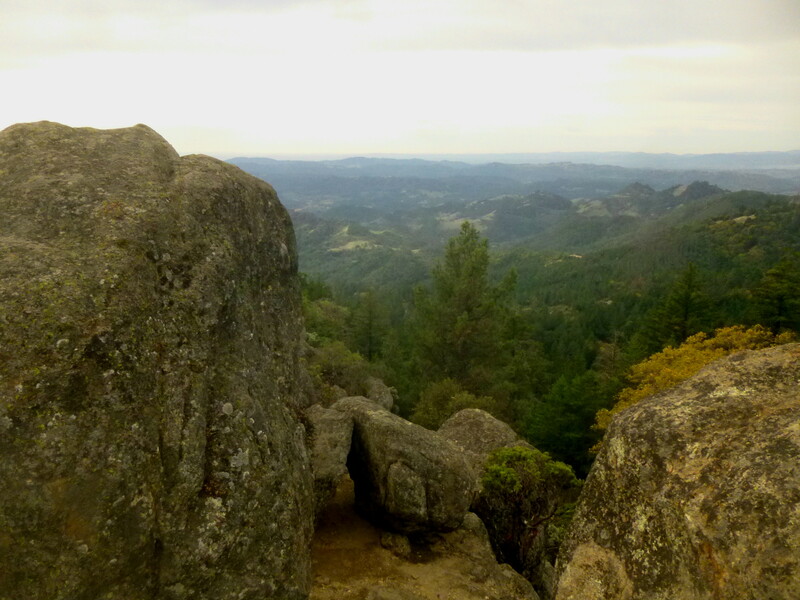 View north from the first overlook, Table Rock Trail. On good days, you can see Clear Lake, Snow Mountain, and even the Sierra Nevada from here. Leaving the scenic overlook behind, the trail again plunges into the trees, primarily pine, though oak and bay—as well as the wildly interesting madrone—are also present. 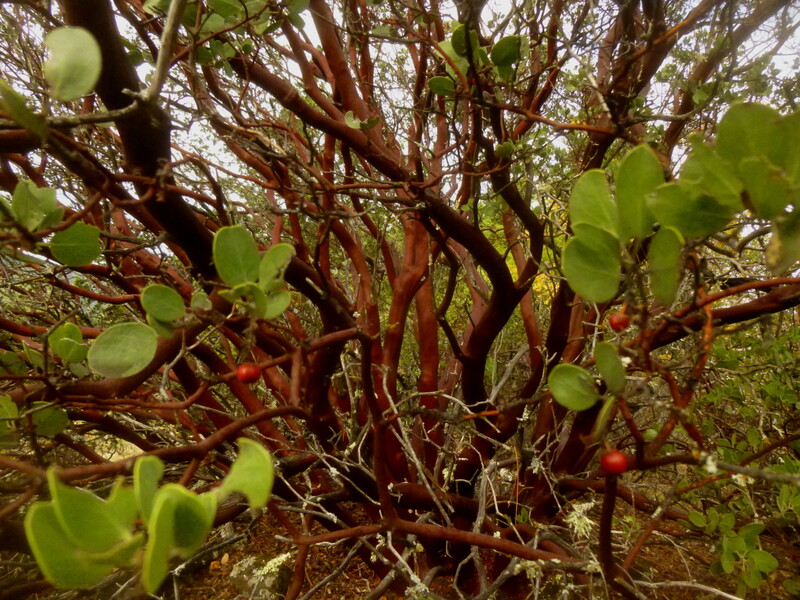 As it approaches maturity, the strange yet beautiful bark of the madrone trees (arbutus menziesii) in this area reflects a dark red hue; branches give rise to bright green leaves and large red berries. 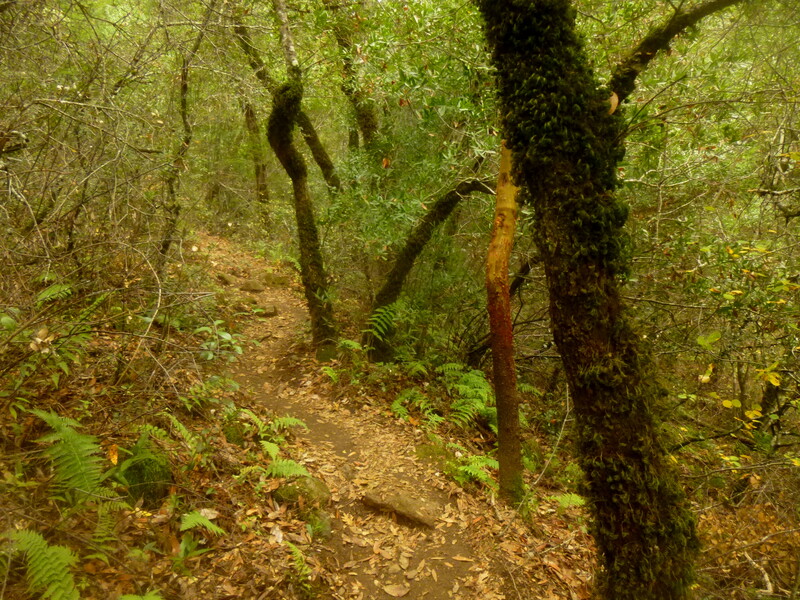 Madrones periodically dot the trail, especially between the first and second overlooks. 1/10 mile beyond the grassy overlook, a clearing facilitated by the installation of power lines offers the first views off to the south. At the mouth of Jericho Canyon below lies Calistoga, nicely framed by greenish-yellow hillsides. From this brief teaser of the scenery to come, the trail gradually ascends among the trees for more than ½ mile. A grove of matured madrones (i.e. the red bark has peeled off, revealing a smooth yellow-orange underbelly) adds interest to the mostly vista-less climb. 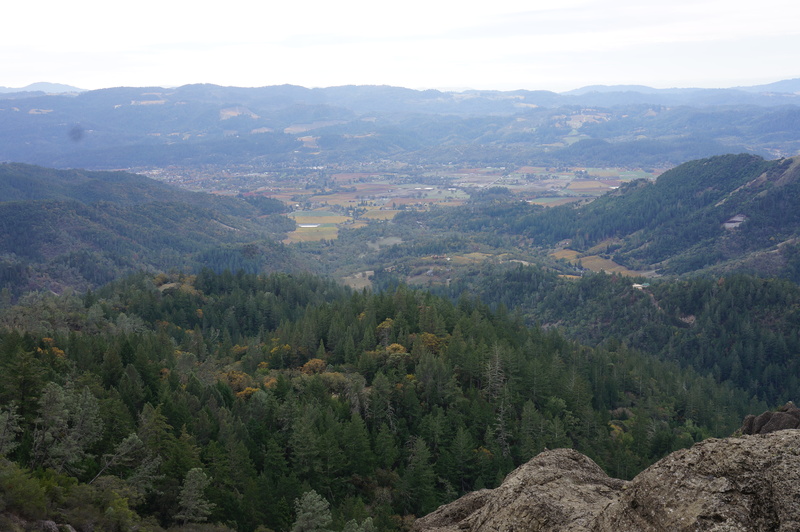 Roughly one mile from the trailhead, the path abruptly emerges from tree cover at a rocky outcropping known to some as “the turret.” Here the views to the south and east are outstanding: much of the upper reaches of Napa Valley unfold below. At roughly 2,750’, this is the highest point reached on the hike. What the first mile of the hike lacks in sustained views, the remaining 1.2 miles to Table Rock more than supplies. Perhaps the most interesting vantage point is straight ahead, to the east: beyond a band of light green pines is an assortment of volcanic crags, casting dark shadows over Bear Valley. These igneous promontories are composed primarily of rhyolite and obsidian—formed by lava flows, then uplifted by tectonic pressure some three million years ago, as what was once a vast ocean gave way to the land we now know as the California coast. Beyond the turret, the trail to Table Rock becomes harder to follow. At least two apparent use trails begin to wind down the east-facing slope. While it’s hard to say which is the correct trail, both lead to the same place: a relatively flat shelf nearly clear of trees about 200 feet below. A series of cairns are visible at the foot of the hill, guiding hikers across the sandy bench ahead. Whoever the creator of this odd spectacle, they apparently were not satisfied with just one labyrinth. 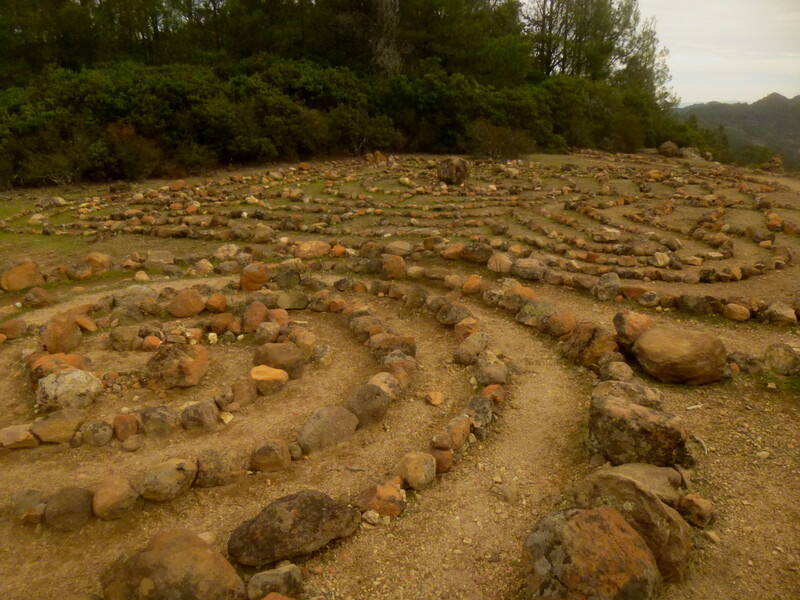 Just steps farther up the trail, you will find a second, slightly smaller maze. For good measure. 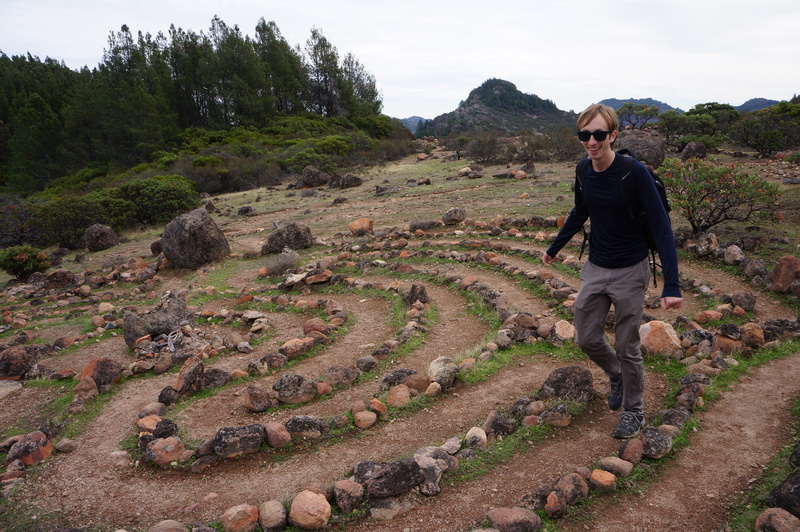 Though certainly odd at face value, the dual labyrinths almost seem to make sense amid the already eerie backdrop of blood red trees and gnarly volcanic crags. 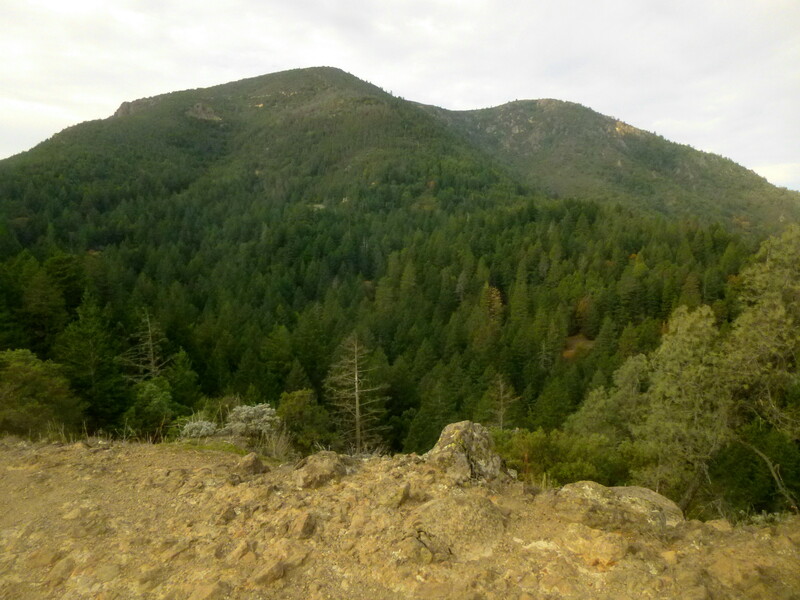 Stevenson alludes to the peculiar atmosphere through the occasional use of metaphors—for instance, by portraying Mount St. Helena as the executor of an “interminable task, making the weather, like a Lapland witch.” The stunning silence—save for the blustering wind and the chirp of an occasional bird—adds a sensation of extreme solitude, a feeling that you are alone in a lunar landscape. Past the labyrinths, the trail begins its second significant descent. 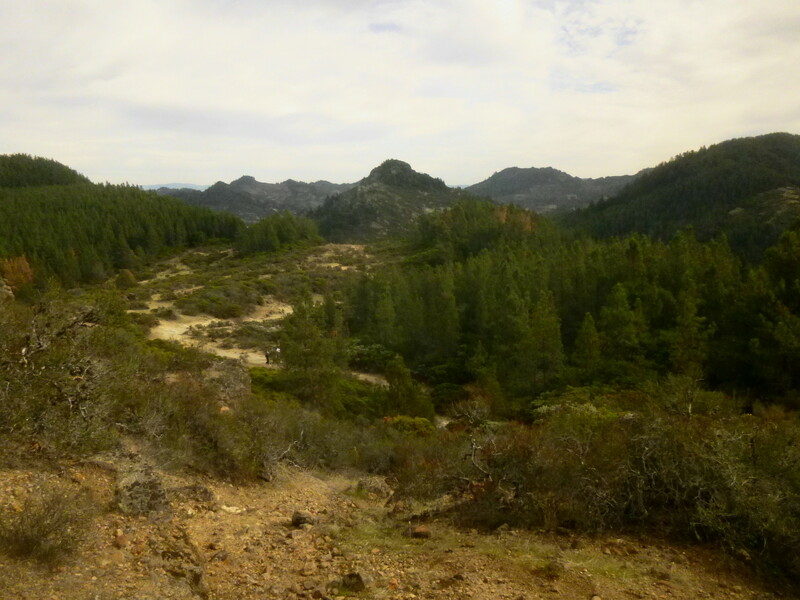 Pine trees—as well as manzanita—abound, and a considerable amount of the trail traverses yellow-white greywacke, a sedimentary rock. About five minutes down the hill reveals flat-topped Table Rock off to the south. During the knee-buckling descent, the natural thought of hikers is of course: I really need to come back up this? 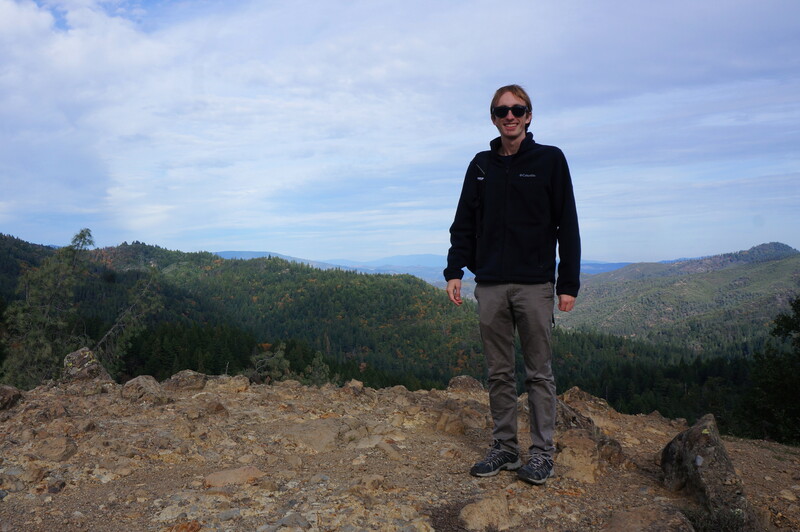 Alas, unless continuing on to the Palisades Trail and catching a ride at the end of a 9.5-mile hike down into Napa Valley, you’ll have to do exactly that. But the scenery ahead is well worth the trouble. 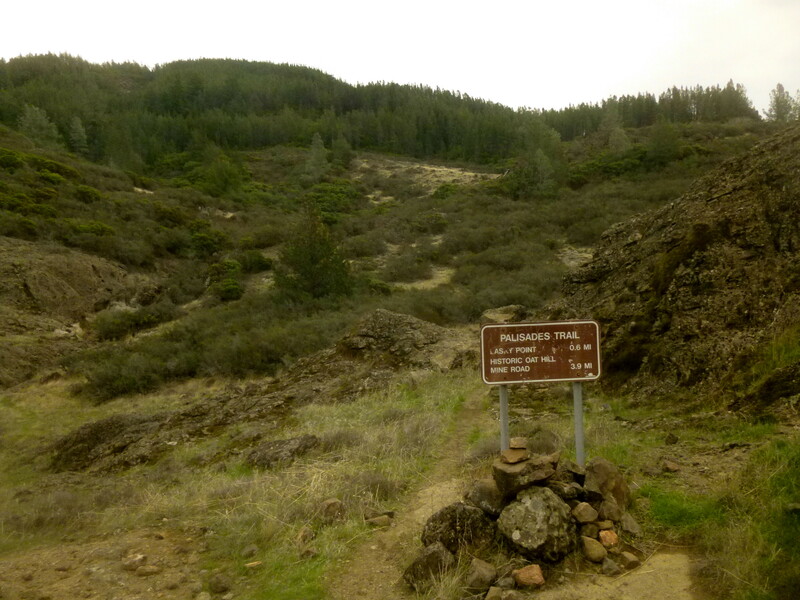 After dropping 300 feet, the trail briefly levels out as it edges toward Garrett Creek, a brush-clogged stream that supports all kinds of riparian life, from willows and manzanita to mosses and toads. 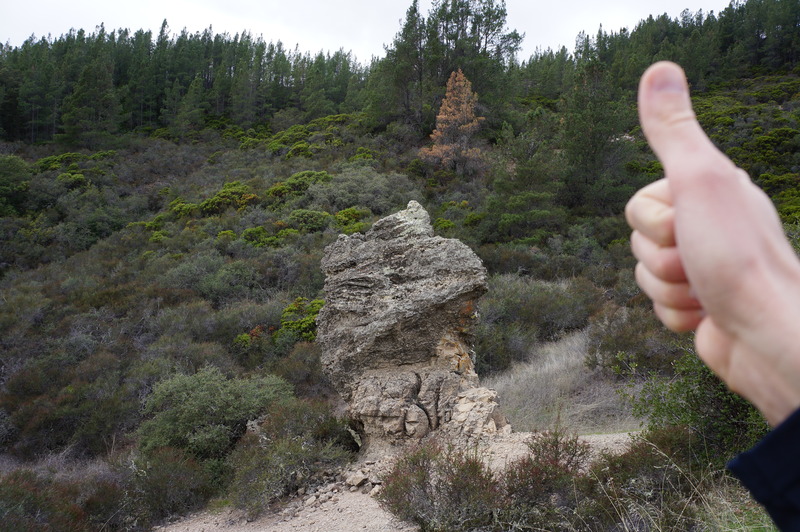 Before crossing the wash bottom, look for a thumb-shaped, rhyolite hoodoo on your right. The gulch beyond is bounded on both sides by impressive, charcoal-colored walls. 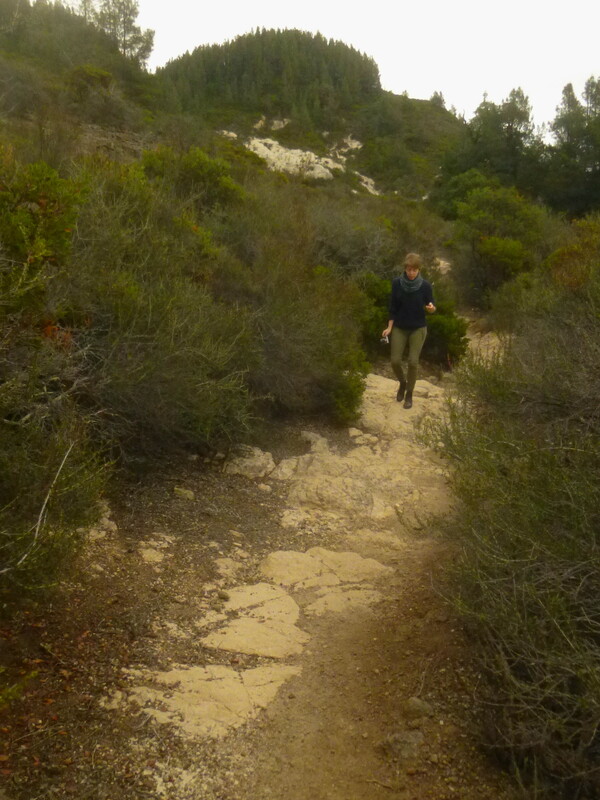 Approximately 2.1 miles from the trailhead, at a sparsely vegetated bowl surrounded by rhyolite rock, the path splits. 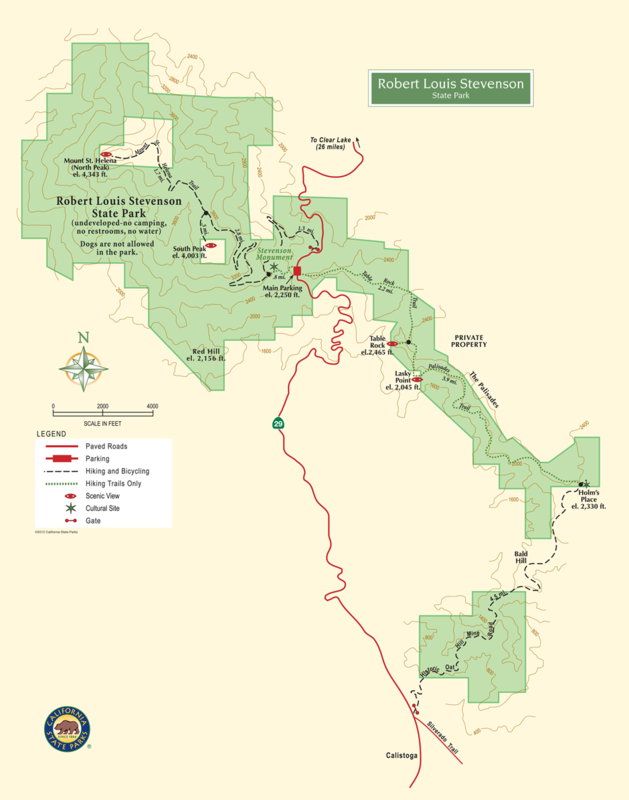 To the left, the 3.9-mile Palisades Trail begins; backpackers or adventurous day hikers can venture up this way. 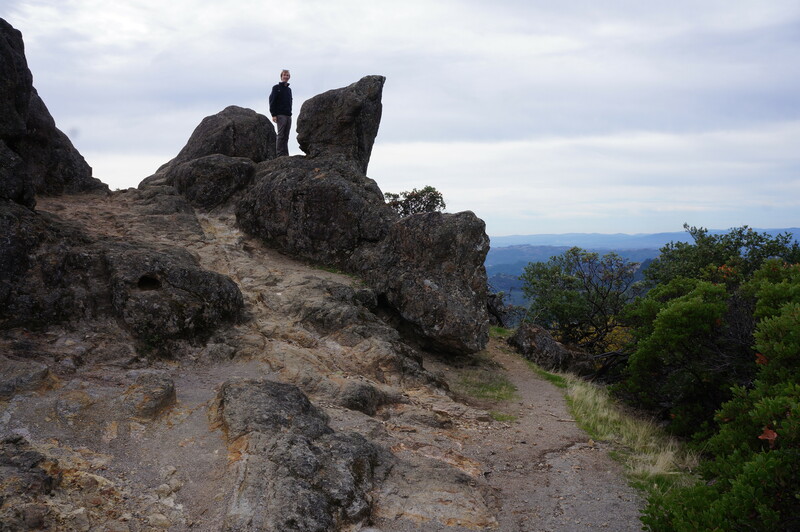 To the right, the short ascent to Table Rock takes off; though steep, the “top” of the rock feature can be reached within a few minutes. Exposed and windswept, Table Rock supports very little plant life, though the lightning-fast peregrine falcon is known to frequent these cliffs. 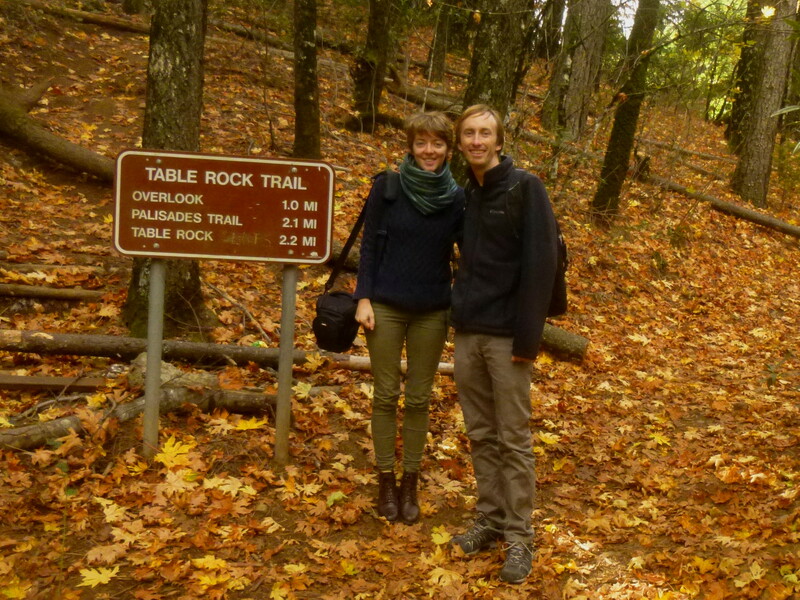 Table Rock is vast and relatively easy to explore, though hikers should exercise caution along the sheer precipices. Total distance to this point is 2.2 miles, though with the frequent ups and downs and many scenic viewpoints, expect the one-way hike to take as much as two hours. Allot another 1-2 for the return journey, which retraces your steps back to the trailhead. Literary fanatics could spend all day, reading excerpts from Robert Louis Stevenson’s memoirs, imagining what the travelling Scotsman thought and saw while squatting in these mountains more than a century ago. And for the conspiracy theorists, of course, this peculiar place is a gold mine. 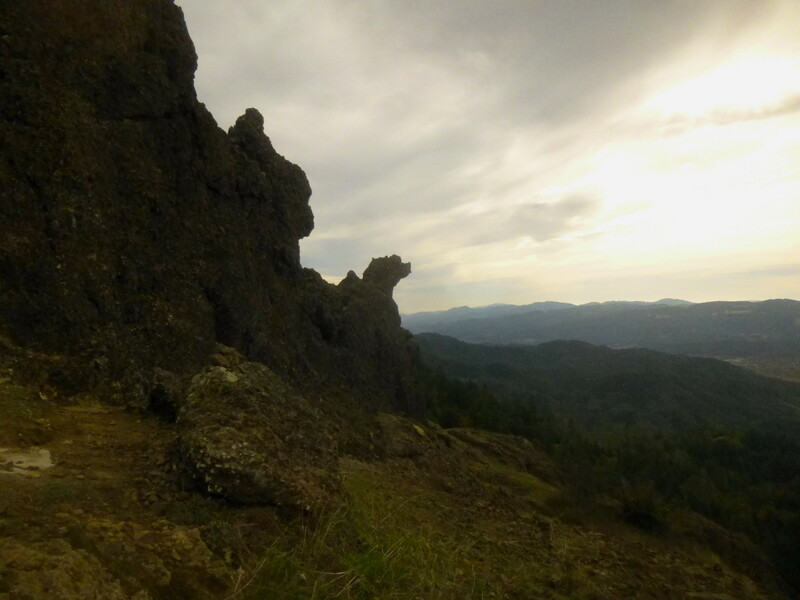 This entry was posted in California, Moderate Hikes, Napa Valley and tagged California, Calistoga, Garrett Creek, labyrinth, madrone, Mayacamas Mountains, Mount Saint Helena, Napa Valley, Palisades, rhyolite, Robert Louis Stevenson, Robert Louis Stevenson State Park, San Francisco, Silverado Squatters, Table Rock Trail, volcanic. Bookmark the permalink. Really interesting post! 🙂 Thought you might be interested in my short film “Death Is No Bad Friend” about Robert Louis Stevenson: http://www.hatchfund.org/project/death_is_no_bad_friend –G. E.
We just this today and loved the scenery and were also surprised about the labyrinths and other “monuments.” Thanks for you excellent report which answered some of our questions. Table Rock has always been a favorite hike of mine. The first time I hiked there years ago was a spring after a rainy El Niño year. The rocks were so colorful with all the lichen. The lichen has never been the same. How is it this year? Hi Joanne! Indeed it’s a great hike. Not sure what it looks like this year; haven’t been out to California in awhile! Cant find the address.so beautiful. Is. Table Rock accessible now (Jan 2018)? I heard that RLS park was closed due to the fires last year. Good question, I’m not sure – I haven’t been back to RLS State Park in awhile.